NASA has released the first spectacular images taken by the Mars rover Curiosity, detailing a mound of layered rock where scientists plan to focus their search for the chemical ingredients of life on the Red Planet. The stunning photographs reveal distinct tiers of near the base of the 3-mile-tall mountain that rises from the floor of the vast, ancient impact basin known as Gale Crater, where Curiosity landed on August 6 to begin its two-year mission. 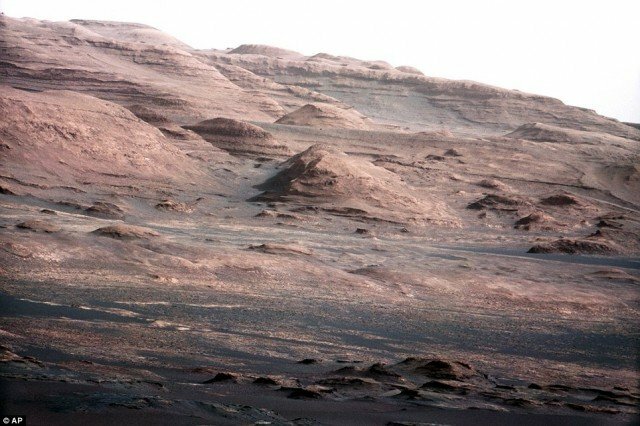 Scientists estimate it will be a year before the six-wheeled, nuclear-powered rover, about the size of a small car, physically reaches the layers of interest at the foot of the mountain, known as Mount Sharp, 6.2 miles away from the landing site. From earlier orbital imagery, the layers appear to contain clays and other hydrated minerals that form in the presence of water. While previous missions to Mars have uncovered strong evidence for vast amounts of water flowing over its surface in the past, Curiosity was dispatched to hunt for organic materials and other chemistry considered necessary for microbial life to evolve. The $2.5 billion Curiosity project, NASA’s first astrobiology mission since the 1970s-era Viking probes to Mars, is the first to bring all the tools of a state-of-the-art geochemistry laboratory to the surface of a distant planet. But the latest images from Curiosity, taken at a distance from its primary target of exploration, already have given scientists a new view of the formation’s structure. The layers above where scientists expect to find hydrated minerals show sharp tilts, offering a strong hint of dramatic changes in Gale Crater, located in the planet’s southern hemisphere near its equator. Mount Sharp, the name given to the towering formation at the center of the crater, is believed to be the remains of sediment that once completely filled the 96-mile-wide basin. “This is a spectacular feature that we’re seeing very early,” project scientist John Grotzinger, with the California Institute of Technology, said as the images were released on Monday. The higher layers are steeply slanted relative to the layers of underlying rock, the reverse of similar features found in Earth’s Grand Canyon. “The layers are tilted in the Grand Canyon due to plate tectonics, so it’s typical to see older layers be more deformed and more rotated than the ones above them,” John Grotzinger said. Absent plate tectonics, the most likely explanation for the angled layers has to do with the physical manner in which they were built up, such as being deposited by wind or by water. “On Earth, there’s a whole host of mechanisms that can generate inclined strata,” John Grotzinger said. NASA said it used the rover to broadcast a message of congratulations to the Curiosity team from NASA chief Charles Bolden, a demonstration of the high bandwidth available through a pair of U.S. science satellites orbiting Mars. “This is the first time that we’ve had a human voice transmitted back from another planet’ beyond the moon,” said Chad Edwards, chief telecommunications engineer for NASA’s Mars missions at the Jet Propulsion Laboratory in Pasadena, California. “We aren’t quite yet at the point where we actually have a human present on the surface of Mars … it is a small step,” Chad Edwards said.